Before bonding the leading edge onto the wing, I wanted to make sure everything fit together nice and flush. Here I am dry fitting everything together. Everything looked great. Also, notice the foam "bumpers" I taped next to LWA2 pucks. Since they cantilever out a bit, I wanted to make sure I didn't knock them off accidentally. I had the quarter pieces ready to go.. I then brought it over to the wing assembly and bonded it in place. I made sure to add slurry to the mating surfaces between FC4 and FC5. I also made sure the ends were where they needed to be. I forgot to remove the strobe light conduit foam. This later haunted me as it was a pain to remove them since slurry bonded a portion of it in place. I won't be making that mistake again when I do the left wing. The next day, I repositioned the wing flat, bottom surface facing up. I should note that I temporarily skipped the last part of step 4 in the plans where it says to cut the inboard piece off of FC4 perpendicular to the inboard shear web face. I wish I would have cut this portion off prior to bonding it to the wing using a bandsaw - but I will leave it on for now and trim it off later. I then reattached the jigs so that I could shim them level to assure proper twist. I used a digital inclinometer and a string to make sure all jigs were 100% level with each other. I followed the "builders hints" on CP#27 and prepped foam panels with release tape to later place on top of the cap to weigh it down flat. This packs the cap layup down evenly and results in less sanding before the skin layup. I then built the dam that goes in front of the shear web between BL23 and BL55.5. I used scrap foam I had laying around... stuck release tape to it and hot glue gunned it in place. I should note that I put tape to the shear web face before hot gluing it in order to protect the shear web. I then taped newspaper to the foam surfaces to protect the wing from epoxy run off... ready for surgery! The plans gives us the following figure on page 19-6. If you notice closely, the figure above shows the distance from BL 23, to where each ply should start. The question I had was, is this measured perpendicular to BL 0... or along the shear web channel (shown by the blue arrow in the figure below)? Since I don't have Burt Rutan's phone number, I then asked myself, "Does it even matter?" To answer this, I had to do some trigonometry (yes, I know... I'm a nerd and I like math!). From the figure on page 19-10, it shows that the shear web is at a 8.57 degree angle (inboard of BL 55.5), and 18.42 degrees aboard of BL 55.5. For the first ply, this meant that if I simply add 5" to BL23... I get BL28. But if I measure 5" from BL23 along the shear web channel, I would really end up at BL 27.9... a difference of 0.1". Does this 0.1" matter? 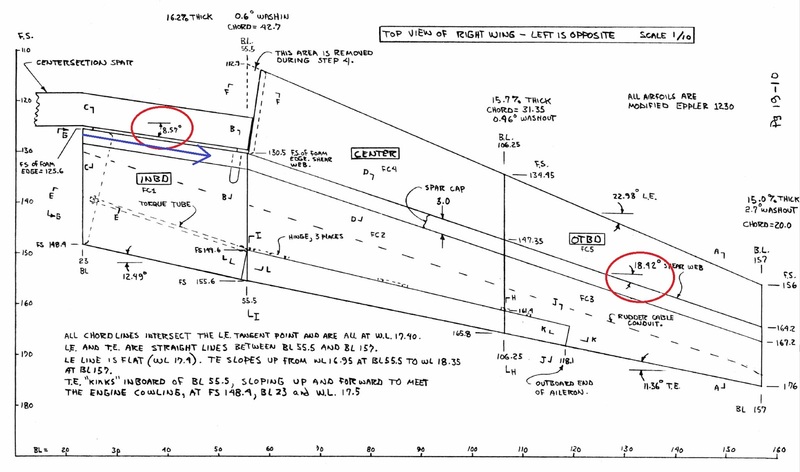 I think not, and probably why the plans don't specify whether to measure it from the BL23 edge along the shear web or perpendicular to the edge for a true buttline BL number. Of course, the further out you get, the more 'error' there is. So I calculated the last ply. If I add 26" to BL23, I get BL 49. But if I measure 26" from BL23 along the shear web channel, I would really end up at BL 48.7... a difference of 0.3". Again, does this really matter in the grand scheme of things? My experience as an engineer says no. Ok, so why am I bringing all of this up? Well CP#25 talks about adding more plies to these caps, since the UNI tape Burt used may be of a different thickness than what is commercially available today (I already explained all this back when I did the center-section spar). The CP says to "Add 1 ply B.L. 25 to B.L. 130, plus 1 ply B.L. 40 to B.L. 90." They don't give us UNI tape lengths this time. So the question I now had was, "How long should I cut these plies?" Do I simply subtract the end BL from the start BL, and call it good? No, no... I'm an engineer... I need to see the numbers! So if I were measuring along the shear web, the distance between BL 25 and BL 130 is 109.4". How did I get that? I'm in engineer... I used trig. If I simply subtract BL 130 from BL 25, I get 105". The difference is 4.4". Now I have to say that is significant. Will the airplane fall out of the sky? Probably not. But since I've already done the math, why not use the true length along the shear web between the buttlines - 109.4". 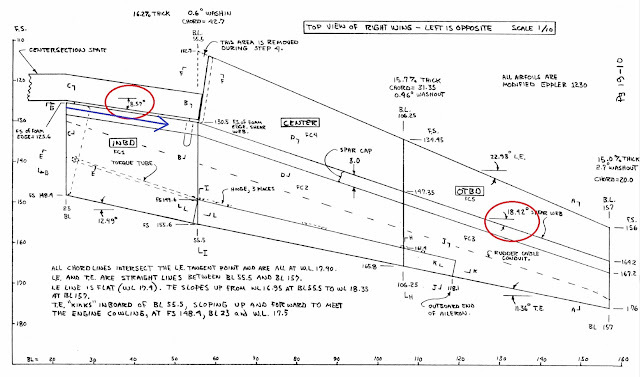 For the second add-on ply, the distance between BL 40 to BL 90 is 52.0" if measuring along the shear web channel. Now that I had all the lengths figured out, I pre-cut all of the 7 UNI tape plies (5 original plies per plans, plus the two additional plies as stated in CP#25). I then placed tick marks on where each ply had to start. Again, since measuring out a true BL versus measuring the distance from BL23 along the shear web is about the same (inboard of BL55.5), I simply measured the distance along the shear web. 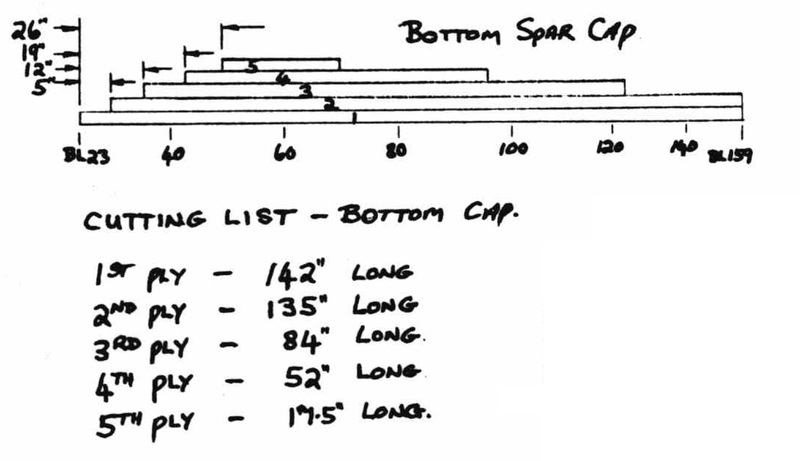 Ok, back to the bottom spar cap! Nothing new here... I explain how to do these UNI caps in greater detail here when I did the center section spar. Elle is really good at baking... so she did a fabulous job at putting the micro icing along the edges.. notice how we skipped over the aluminum pucks... thinking plain epoxy will do a better job at bonding the cap to the metal pucks anyway. With the surface ready... we installed the first ply. Although I was confident that I cut all UNI tapes to correct lengths, I had pre-calculated (and marked) where each UNI tape should reach. The numbers for the UNI tape ends shown might be confusing, since I calculated distances from the outboard wing tip. In other words, the picture above shows the added ply between BL 40 to BL 90. It shows '17' because BL40 is roughly 17 inches from the inboard edge. 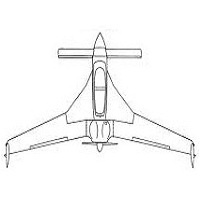 The picture below shows it going to a tick mark labeled '70.6'... because BL 90 is roughly 70.6" from the outboard wing tip. There you have it! Bottom spar cap complete! I see you're still going strong! Keep it up, soon you'll have air under your wings. Ary, I've been following your progress for some time. The workmanship continues to be first rate and the overall documentation really is excellent. Great job and a big thank you for the incredibly consistent web log format, pictures, and time-lapse. Thanks TDC and Todd for your kind words! It's messages like these that keep me motivated to keep this blog going! Glad you guys are liking it! Thanks again! Darn good job on the Longez....reading your blog and watching your youtube videos is a really good motivator for working on my own flying machine! Keep it up and I cant wait to see you fly that longez!